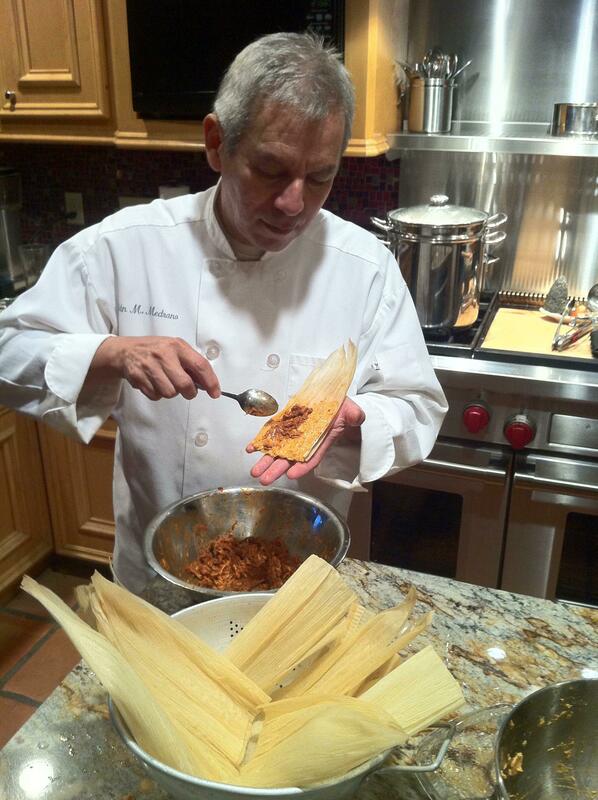 This San Antonio tamale recipe was taught to me by my sister, Esther M. Martinez, who learned it from our mom, Dominga M. Medrano, who learned it from her mom, María Victoria Vargas, and so forth. Esther also learned aspects and nuances of tamales from her mother-in-law, Antonia O. Martinez who learned from her mom, Florencia C. Ortega. These tamales differ from tamales of Northern Mexico in flavor and texture. We add hot fat rather than whipped fat and thus produce a more substantial bite. We also don’t use oregano in the spice profile, leaving it to the chiles to play an unaccompanied role, nor do we roast the chiles. Trade routes flourished among native peoples before the arrival of the Europeans. From Central Texas down to Southern Mexico, communication and travel promoted the exchange of recipes for corn, chiles and other foodstuffs. 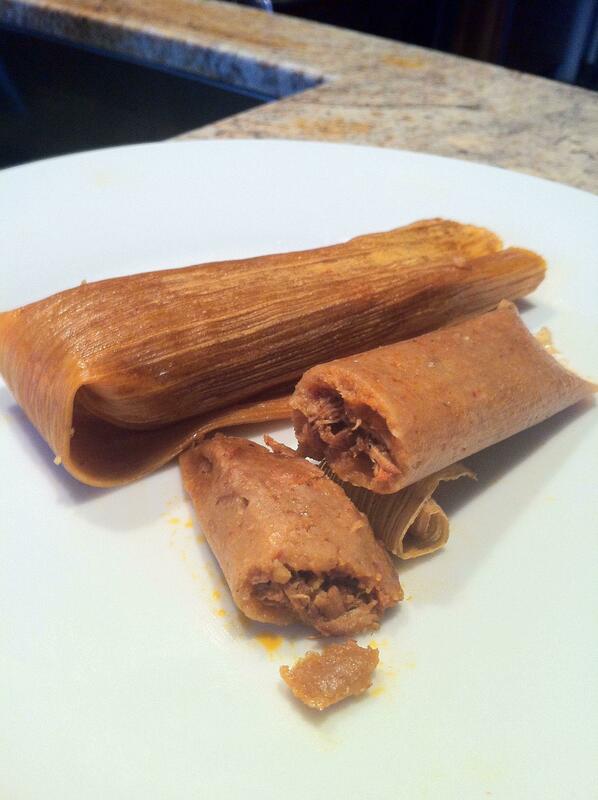 All regions had tamales but each in their own style. Our region is called the Coahuiltecan Region (Just N & S of the Rio Grande River) and I’m proud to say that our indigenous recipe is as delicious as ever! 1/2 cup Canola oil. This is updated, of course, since our mom used rendered pork fat, lard. But it is also a recapturing of our pre-European roots since lard is a Spanish contribution to native cuisines. 1. In a large saucepan, cover the chiles with water and bring to a boil. Turn off the heat and let the chiles steep for 15 minutes or until they are tender. 2. Drain the chiles, discarding the water, and place the chiles in a blender along with the garlic and cumin. 4. In a Dutch oven, heat the Tbsp canola oil and fry the chile paste until it begins to change color and most of the liquid has evaporated. 5. Add the water and simmer for about 15 minutes and then adjust the salt. The sauce should have a complex, non-green, non-pungent flavor. I think it tastes delicious. 3. Adjust the mixer to low and slowly pour the hot oil (not warm but hot) into the masa to incorporate. It will sizzle as it makes contact. (watch out for dangerous splatter). 4. When the oil is incorporated, turn up the mixer to medium and mix well. Add water as needed to make a thick batter, a bit thicker than a cake batter. The masa can then be spread on the corn husks to be filled and steamed. More on the variety of fillings and steaming later. * NOTE: Although problematic, I use the term “Coahuiltecan” for the purpose of breaking away from the border-fixated term, Tex-Mex. The natives did not call themselves Coahuiltecans, since they were so many different peoples. It is researchers who used the term. But the term does give the region a place, keeping the river as a source of water and travel, not just a border. My intention is to preserve the food history of the region which predates, certainly does not exclude, the current geopolitical jurisdictions of Mexico and Texas.